トップ > ASP > 'Careful goodbye at the door': is there role for antimicrobial stewardship interventions for antimicrobial therapy prescribed on hospital discharge? 'Careful goodbye at the door': is there role for antimicrobial stewardship interventions for antimicrobial therapy prescribed on hospital discharge? Antimicrobial stewardship (AMS) interventions largely target inpatient antimicrobial prescribing. 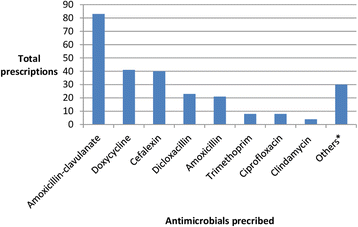 Literature on appropriateness of antimicrobials prescribed at the interface between hospital and the community is minimal. This study was designed to assess the appropriateness of antimicrobials prescribed on hospital discharge and evaluate the impact of AMS interventions. Patients with discharge medications processed by the pharmacy were identified using a computerized pharmacy medication tracker over a four week period. The antimicrobials prescribed on discharge were assessed independently for appropriateness of antimicrobial choice, dose, frequency and duration. Data on various AMS interventions was collected. Univariate followed by multivariate logistic regression (MVLR) analysis was performed using SPSS V 23 (IBM, California). A total of 892 discharge prescriptions were processed by the pharmacy department, 236 of which contained antibiotic prescriptions. Of these, 74% were appropriate for antimicrobial choice, 64% for dose, 64% for frequency and 21% for duration. In particular, 71% of patients received a course in excess of Therapeutic Guidelines-Australia(TG-A) recommended length of treatment. On univariate analysis, discharge antimicrobial prescriptions were more likely to be appropriate for antimicrobial choice, frequency and duration; appropriate microbiological specimens were more likely to be taken and targeted therapy more likely to be given when the AMS team was involved. On MVLR, appropriateness with antimicrobial dosing frequency [OR 5.6(1.9-19.2)], microbiological specimens [OR 4.3(1.6-11.6)] and receipt of targeted therapy [OR 2.8(1.8-6.2)] with AMS involvement remained significant. A large discrepancy exists between antimicrobial regimens prescribed on hospital discharge and those recommended in consensus guidelines, particularly concerning duration of treatment. While AMS interventions are well established for improving antimicrobial prescribing in hospital inpatients, the hospital-community interface remains a challenge in terms of antimicrobial prescribing and exposes patients to potential harm. There is a clear need for AMS interventions to extend to antimicrobial therapy prescribed on discharge.